Wow your neighbors with our Mega Tree kit! 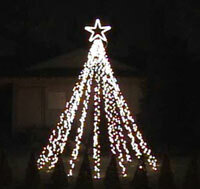 Just add Lights, 10 foot PVC Pole/Telescoping Flag Pole, and Ground Stake to build a 16 - 64 output mega tree. Just getting started? Check out our Getting Started Packages.